Southwest Chicken Burgers - Kosher In The Kitch! Southwest Chicken Burgers - Kosher In The Kitch! Prepare quinoa as directed on box. (I used red quinoa but you could use regular) Saute the garlic in oil until nice and crispy however not burnt, then add the sliced mushrooms. While the mushrooms cook, prepare the burgers. Add the diced onion, jalapenio, cilantro and egg to the ground chicken. Spice it with Salt, Cumin and Turmeric. Mix well. Form patties and fry in a pan or bake in the oven on high for about 5 minutes each side. 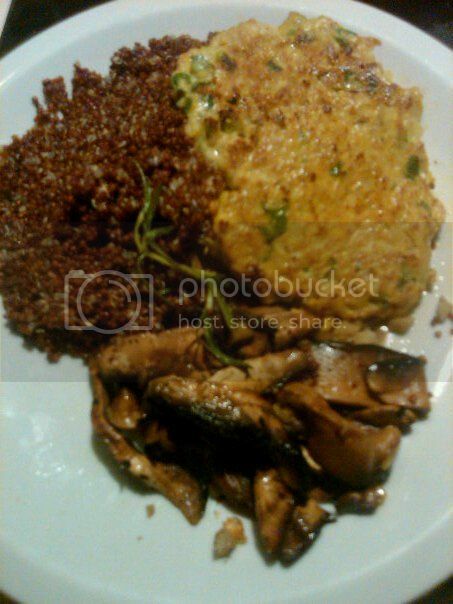 Serve with the Quinoa & Mushrooms. * If u don’t want the heat of the jalapenios just remove the seeds inside, but I like the bite! The chicken burgers can also be served in a bun with your favorite burger toppings.